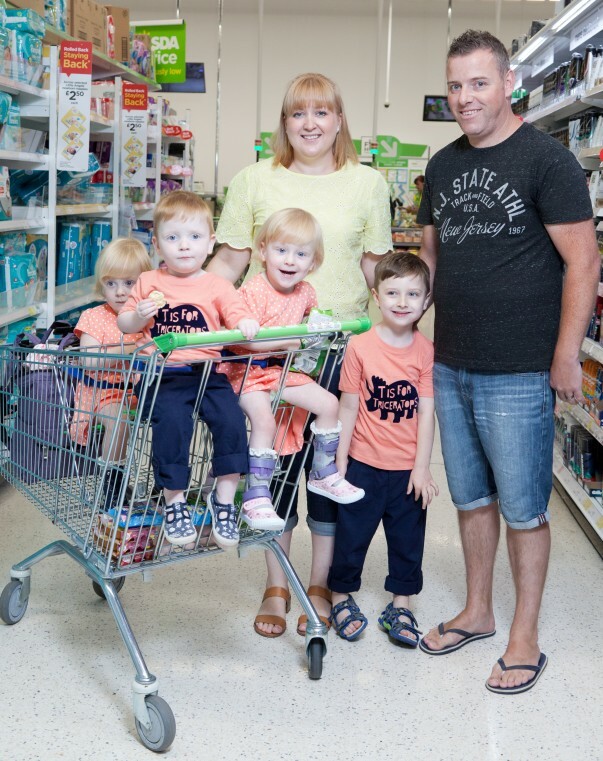 Parents Mike and Kerri Taylor used to struggle with their shopping trips – until our Hereford store’s manager Stuart Goldspink arranged for this specially-designed trolley for their triplets. 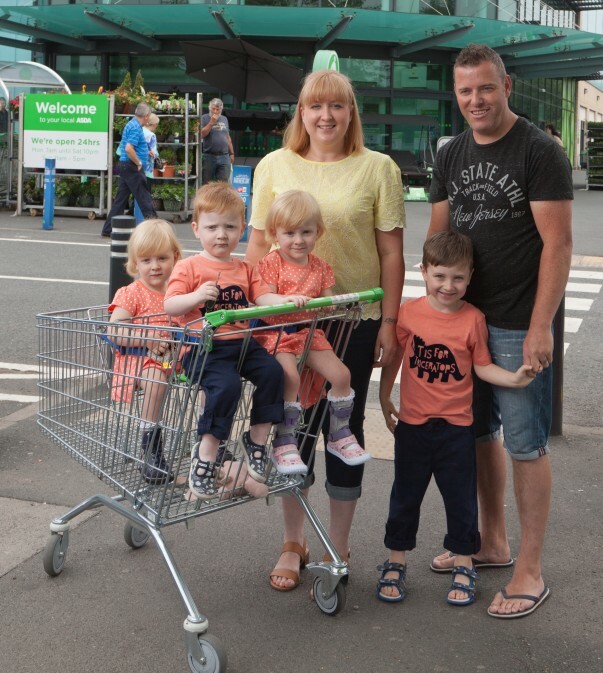 Mike says two-year-olds Arthur, Violet and Keeva really enjoy being together in one trolley on their regular visits to Asda with big brother Edward, who’s five. Mike said: "It's transformed our shopping experience! We’re very grateful to Asda and Stuart, who’ve been very helpful." The family call at the store several times a week and used to use two separate double trolleys. Mike said: "We're regulars at the store, so Stuart always says hello to us. One time we asked him if there was such a thing as a triplet trolley we could use every time we came in. He said he would try his best to get one for us – and now he has! "With the triplets, and with Edward with us too, we always had to have two trolleys, and it was a bit of nightmare. We had to split the triplets up, and have two in one trolley and one in another. "On top of everything else, if Edward wandered off, as five years olds tend to do, both of us would already have our hands full with a trolley each. Stuart said: “We really wanted to help Mike and his family, so I’m really glad we managed to get one manufactured, tested and delivered to the store. We kept in close contact with them on progress while we were getting hold of the trolley and when it arrived, we phoned the family straightaway. "They came in to use it and are really positive about it. It's much better and more efficient for them, and they can navigate the store more easily." The triplets were born at Birmingham Women's Hospital 11 weeks premature and were in special care for nine weeks. Violet and Keeva have cerebral palsy. Mike said: "Keeva can't walk unaided – we're not sure at this stage if she will ever be able to walk – and Violet has special boots to help her walk. "But they are happy little souls, they are outgoing and they enjoy playing together. "It was difficult for Edward at first when we brought three new little siblings home for him, but he's great with them now – he looks after them and plays with them." 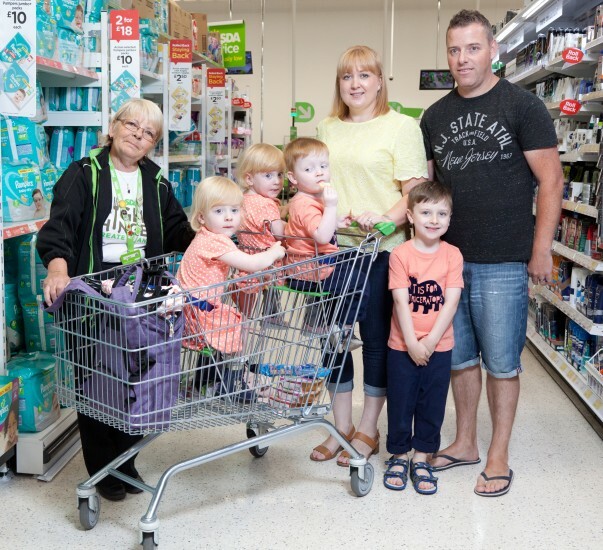 The store's community champion June Thurston, picture above with the Taylors, said: "They're a really lovely family, really friendly – and the children are adorable. "They're over the moon that we went the extra mile for them, and I think the children feel very special now they've got this special trolley." Michelle Cooper, our asset replacement coordinator, said: "Anyone looking for a similar trolley should speak to colleagues on the customer service desk, who will be able to order one which will then be specially made by our suppliers. The trolley should take around six weeks to arrive in the store. They’re only available in stores without travelators. "It's great for us to help our customers in any way we can."